In this tutorial, we will show you how to login to your Linux VPS using SSH keys. We will generate a key pair (private and public key), place the private key on your server and then use your locally stored private key to gain access to your server. This method provides a more secure way of connecting to your server, instead of just using a password. To set up SSH keys, carefully follow the steps below carefully. We will split this guide into two sections and explain how to generate an SSH key pair on both Linux and Windows operating system. In this section, we will go through how to generate an SSH key pair on a Linux or any other Unix-like operating system. You can just press Enter to leave the default values of all the questions. Optionally, you can also set a passphrase for your key, or just press Enter again if you don’t want to. Next, you will need to upload the generated public key to your remote server. Change the permissions of both the .ssh directory and the public key. If you are using the Windows operating system on your local machine, then you will need PuTTY for connecting to your server via SSH and PuTTYgen to generate your SSH keys. You can download the latest versions over here. At the bottom, you can choose the number of bits for your generated key. Type in 4096 and then click on “Generate”. Start moving your mouse around over the blank area in the PuTTYgen screen in order to generate a unique key based on your mouse movement input. To save the private key, you will need to click on the “Save private key” button. Additionally you can also set a “Key Passphrase” for your private key that you will need to use everytime you log in to your server using your key. Now you can open PuTTY and assign the location of your private key. Click on “SSH” under the “Connection” menu and then click on “Auth”. Click on the “Browse” button and enter the location of your saved private key file. Next, you will need to upload the public key to your server. To do this, click on “Session”, enter your IP address and the SSH port number of your server, select SSH for Connection type and click on “Open”. You will be asked for your username and password. You can log in as user root, using your root password. With this, the SSH keys have been successfully configured. You can now disconnect from your server and exit PuTTY. The next time you try to connect to your server, PuTTY will use the public key that you have set up in order to establish the connection. 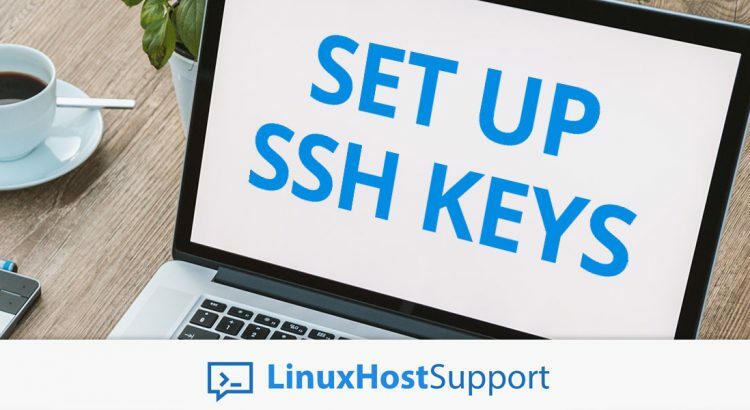 Of course, you don’t have to set up ssh key by yourself if you use one of our outsourced server support services, in which case you can simply ask our expert Linux admins to help you set up the SSH keys for your server. They are available 24×7 and will take care of your request immediately. PS. If you liked this post on how to set up SSH keys, please share it with your friends on the social networks using the buttons on the left or simply leave a reply below. Thanks.